One of the best shows on television, and one of my current favorites, is Rick & Morty on Cartoon Network’s Adult Swim. It delivers obvious pop culture laughs, throws in discrete “inside jokes” of the nerd universe, and addresses deep issues with outlandish situations and dark humor. 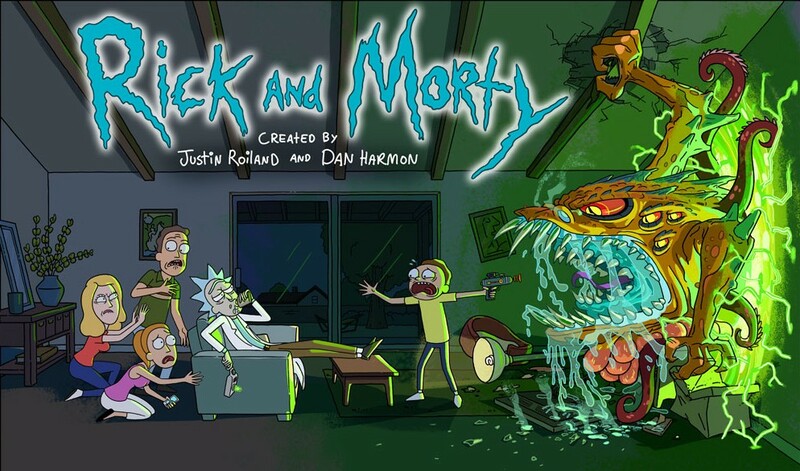 Written by Justin Roiland (Fish Hooks) and Dan Harmon (Community) and staring voice actors Chris Parnell (SNL, 30 Rock) and Sarah Chalke (Scrubs), Rick & Morty’s stories are smartly written and include ridiculous happenings which range from funny to “I should be wearing a diaper because I might pee my pants” hilarious. At times I am simply left saying “wow” with some of the developments and revelations. The eccentric super-genius main character has drinking problems even when partaking in crazy adventures with his grandson Morty. Think Nikola Tesla/Doc Emmett Brown meets Bluto (Belushi’s character in Animal House). Rick’s grandson and Robin to his Batman, he often acts as a conscience and voice of reason for Rick (who seemingly lacks one). He is easily identified by his crackling voice due to early stages of puberty. Morty’s dad and Rick’s son-in-law. An almost stereotypical beta male, with a severe inferiority complex, that is a regular punching bag for Rick, but is evolving nicely throughout the series. Morty’s mom and Rick’s daughter. She rarely holds Rick accountable for his actions because she is afraid he will become estranged in another dimension (again). She often takes out her life frustrations on Jerry. Morty’s older sister. In season 1 she was mostly a bratty, insecure teenage girl but her part in episode 9 (Something Ricked This Way Comes) is truly one of S1’s highlights and it looks like she is becoming more of a central character in season 2. Now go watch it (Sundays at 11:30PM on Cartoon Network); I said EVERYBODY or you’ll get beat down like the Devil.